Among Gatliff visitors are those who cruise to Rhenigidale by road and those who use the Path. Then there are those who recall the days when there was no road. It is a construction of the 1980s with European Community funding that ceased for a while. However, the route migrated from a construction site to a Land Rover track to a metalled road that was in use by the time of its formal opening in 1989. The photograph here is of a Priestman digger, still apparently in active service, which was used in the original work that had started 30 years ago. 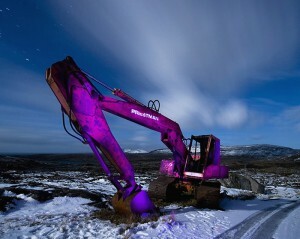 For more images of these machines and times see Diggaz with Attitude.